Cute. Jazzy. Snazzy… with a little bit of flair or not—depends on what floats your boat and makes your heart sing. Because your uterus isn’t singing during your period. It’s weeping blood. 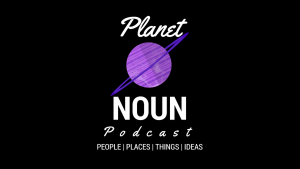 In this bonus episode of Planet Noun, Liz and her sister, Lea, pick up with their discussion about stuffing the perfect Pad Bag. That’s just another name for a to-go sanitary/feminine supply bag. A cute bag. Animal print is recommended, but whatever design or color makes your heart sing. A pack of pads in a size that suits your needs. A pack of tampons that suit your needs. For example, I’ve been trying organic tampons by L.
A ‘backup to the backup’, is needed. Back in the day, Le-Le and I used Depends, which are diapers for incontinent adults. There are other brands available as well. A really good friend of mine recommends Always Discreet. Shoot, you might as well pack a doggone overnight bag. From there, we also talk about praying the ‘Broids away, and whether we think that works…to how social media can be harnessed to find connection with others grappling with uterine fibroids.